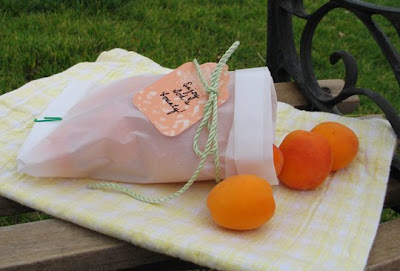 For this post I'm joining in with Kimba over at A Soft Place to Land for her lovely Garden Party. Please visit her blog to see links to TONS of cool decorating/outdoor/garden ideas! 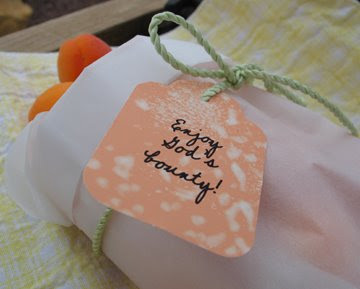 Love those parchment paper bags. Great idea! Beautiful fruit, and so sweet of you to share it. How thoughtful and what a beautiful presentation! You always have to best ideas! Love it! What a cute idea! I am always looking for neat paper ideas! Great idea! 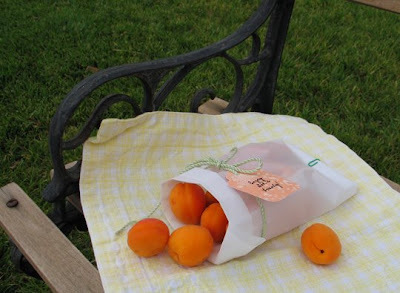 Our apricots haven't ripened yet. Everything is behind this year at our house. I do believe I am salivating! Ooo, what a great idea! Love that. Thanks for the comment on my blog. We're hoping for a quick home sell as well... we'll see! Yum! We want to be your neighbor! Too cute in their delightful packages. Thanks for sharing that delightful idea!!! 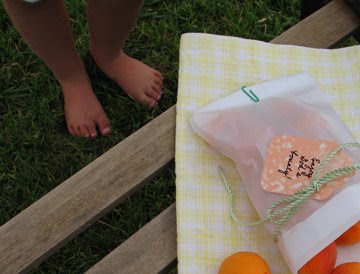 I'm so happy I found you (a big thanks to Nesting Place)...what wonderful ideas you have! Thank you for sharing...you have such special talent! Look forward to "keeping in touch" in the blog world! PS~Thank you for visiting m&m's world...your comment made my day! I wish I were your neighbor! I was just telling hubby that I really want to plant some apple and pear trees this year. This is such a great way to share our gardening bounty. Oh, oh, oh !!! I feel like I've discovered something wonderful ~ your blog! I could spend hours here reading each and every post (but I'd best not ;o)! Looking forward to 'healthy little chunks of time' gleaning wonderful ideas here. Mmm...I love apricots. Your photos are lovely.